Federal Pacific Breakers - Are they really a fire hazard? Federal Pacific Electric (FPE) Circuit Breakers - Are they really a fire hazard? Any licensed electrical contractor who has been in the business should be able to answer this question but for everyone else we have included a link below that will answer any question you have ever had about that type of circuit breaker. We at GRM Electric do not and will not sell, Replace or install new this type of circuit breaker for liability reasons, It is STRONGLY RECOMMENDED that if you have a Federal Pacific circuit breaker panel like the one in the picture that you get your electrical service updated. 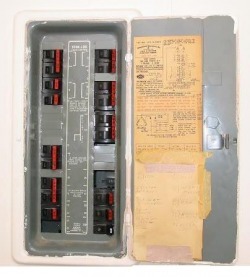 If a complete service upgrade is not within your budget at least consider replacing the circuit breaker panel box. Q: Do you install Solar panels? A: Solar panels are increasing in popularity. There are many tax & rebate incentives to this new trend however we do not install them at this time. We feel that this is a specialty field and would recommend you call someone who specializes in this type of electrical installation. We can prep/ Upgrade your existing electrical service to be ready for when you decide to incorporate solar power into your home but we don't do the actual solar panel system installations. ​Q: Do you install Automatic whole house generator systems? A: We feel this is a specialty field. We don't get into automatic home stand by systems but however we can prep/ Upgrade your existing electrical service to be ready for when you decide to incorporate a home stand by generator system into your home. We have a few specialists we can recommend to you for automatic generator systems. Q: Do you install Roof heating cables? A: Unfortunately we do not install them. We can install exterior GFCI outlets that the cables would plug into but that's where we draw the line. Insurance regulations do not allow us to work on roofs being the main reason. Reason # 2 is that roof heating cables should be a last resort when all other options to correct ice build up have not corrected the problem 100%. Using roof heating cables only covers up a major problem wasting electricity in the process. Ice builds up due to poor insulation and poor ventilation in attics. It is best to hire a company that specializes in correcting this type of problem rather then covering it up by installing roof heating cables. We can recommend some professionals for you if you are unsure of who to call. Q: Do you guys do commercial or industrial work? A: We have in the past but decided to take the company in another direction and focus on doing only one thing and doing it very well. We are set up for residential installations & repairs. We are residential electrical specialists. A: ALL work in the city requires an electrical permit and that a licensed electrician be on site at all times from start to finish. Generally speaking jobs in the city take much longer and tie up valuable resources and have increased overhead. When we decided to take the company in a different direction we decided we would no longer do any electrical work within the city limits so that we could focus our efforts assisting our main customer base. We can recommend a licensed specialist who can better assist you with electrical work within the city and who's got an excellent handle on the permit and city inspection process. Q: LED Light bulbs - Why don't LED bulbs work in all of my light fixtures? A: LED stands for light emitting diode. A light emitting diode is a semiconductor that emits visible light when current passes through it. A semiconductor is an electronic and as with all modern electronics there are limitations to how they function. Check to see that the LED bulbs you purchase are compatible with dimmers or motion sensing equipment. Q: ARC Fault Circuit Breakers - What is an ARC Fault circuit breaker? A: ARC Fault circuit breakers are special circuit breakers similar to GFCI circuit breakers that have special electronic circuitry built in. Poor, Broken or dirty electrical connections may cause arcing which in turn may start a fire. The special circuitry built into these breakers can sense this fault and will shut the electricity off to the circuit preventing a possible fire. Most NEW circuits in a residential setting are now required to be on an ARC Fault circuit breaker. Q: RG&E shut my power off. Can you turn it back on for me? Q: Aluminum Wiring - Is it a fire hazard? Should I rewire my whole house with copper wiring? A: Many older homes were wired using aluminum wiring, There have been some house fires associated with what some people think is the wiring itself but this is false. Most of those house fires were a result of the wrong devices being connected to the aluminum wiring. A device is a plug outlet or a switch. Devices that are rated for use on copper wiring (CU Rated) should ONLY be used on copper wiring. There are devices that are rated for Aluminum only (ALR Rated) which is what is recommended in this situation. There are also devices that are rated for both (ALR) & (CU) which are okay to use on aluminum or copper wire. If a device is only rated for copper (CU) only then it should NEVER be connected to aluminum wire or it may start a fire. So the answer to the question is no you do not need to rewire your whole house you just need to have the right devices installed. Q: GFCI Receptacles - Why do they trip? A: GFI's are designed to measure the current on both legs of power on a device. If the current going in is any different that what is coming out then the device will shut off or trip because it detects a ground Fault. This happens so it prevents you from completing the circuit through your body to the ground and getting a possible shock. GFI's have a test button on them and should be tested monthly for proper operation. Also if you plug anything into a GFI and it trips then have whatever it is you plugged in looked at for a possible problem, A frayed cord or water getting inside the item plugged in could be a cause of the GFI tripping. DO NOT just assume the GFI is malfunctioned and plug the Item in a non GFI controlled outlet as a potential safety issue exists. Q: Service Upgrades - If I install a 200 amp service on my house to replace the 100 amp service that is there now will it give me "More Power"and prevent fuses from blowing or circuit breakers from tripping and prevent lights from getting dim when large appliances come on? A: No it will not! Unless it is the main breaker that is tripping you do not need to upgrade to any size service larger then what you already have to correct this type of problem. The correct way to fix circuit breakers that trip is to run new wiring of the correct size from the circuit breaker panel to the appliance that is causing that breaker to trip and install it on it's own dedicated circuit. The voltage coming out of a 200 amp service will be the same as that coming out of a 100 amp service, 120 volts. Unless you heat your home with electric heat or have 5+ tons of air conditioning in your home you do not need a 200 amp service. We will gladly install a larger service for any customer but please be advised it may not fix any existing electrical problems you may already have.